Kufi was the major priestly script in early times . It was created after the establishment of the two Muslim cities of Basrah and Kufah in the second decade of the Islamic epoch ( 8th century A .D . ) . The script has particular proportional measurements , along with pronounced angularity and squareness . It became known as al-Khat al-Kufi ( Kufi script ) . Kufi script had a distinct impact on all Islamic calligraphy . In contrast to its low verticals , Kufi has horizontal lines which are extended . The script is remarkably wider than it is high . This gives it a specific dynamic momentum . The script often is selected for use on oblong surfaces . With its glorious Handasi ( geometrical ) construction , Kufi could be modified to any space and material. 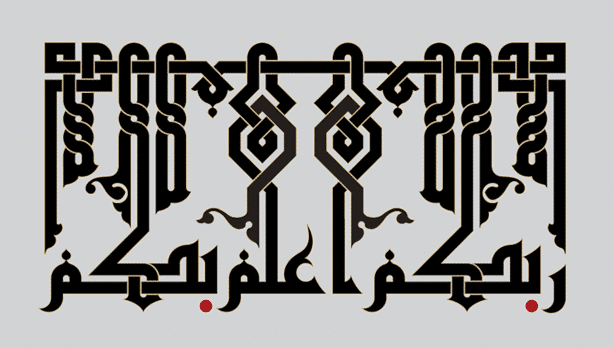 The great variety of stunning techniques of the Kufic script is quite peerless and exceptional . Some forms are mostly ornamental while other forms were used for texts whose reading was of prime significance . Among the styles of Kufic script , some are characterized by “local” or “regional” peculiarities in keeping with the distinctive geographical features of that region .